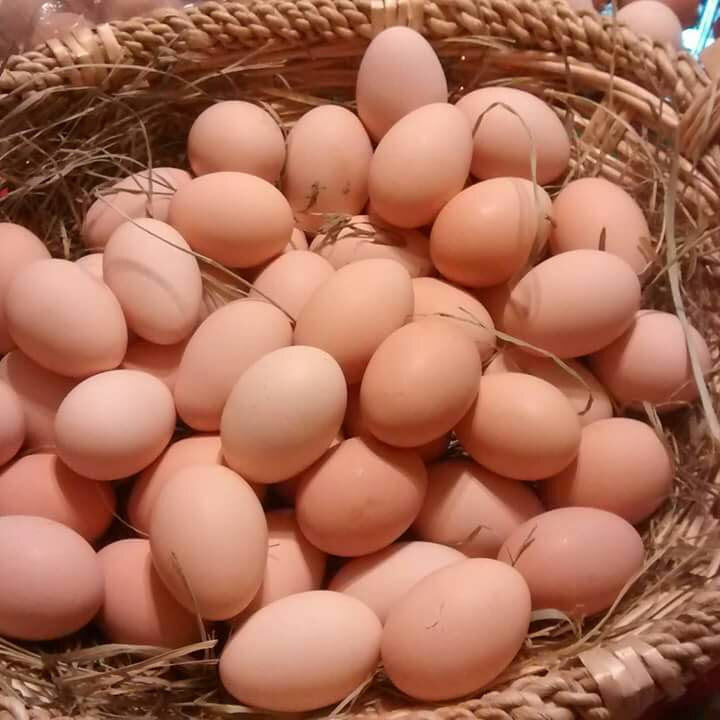 The farm currently produces pasture-raised broiler chickens, eggs from pasture-raised hens, pastured pork, pasture-raised turkeys, and grass-fed lamb. All animals are raised on pasture and provided with non-GMO supplemental feed and minerals as needed, with the exception of lambs that receive no supplemental feed. The pastures are maintained using management intensive grazing techniques. Management intensive grazing techniques help build naturally fertilized soil, sequester carbon, and reduce water runoff. No artificial fertilizers, herbicides, pesticides, growth hormones, or antibiotics (unless needed to treat illness) are used. Chickens and turkeys are humanely processed on-site. Sales are farm direct and through local farmers markets. Our goal is to do our part to shift the current paradigm away from large, corporate owned, environmentally destructive, factory-style farms toward small, family owned, environmentally responsible, local food systems. We want our families, friends, and customers to be connected to their food. Every so often we are asked if our products are organic. The simple answer is: no. However, it really isn’t that simple. In order to say we are organic, we must be certified. That certification requires mountains of paperwork, meticulous record keeping, and paying a third-party certifier. Currently, we have neither the time nor the resources to do this. 1 – Hens must be raised in a cage-free environment. Cage-free means exactly what it sounds like, the birds aren’t in cages. They can, and usually are, raised in giant chicken houses with over 10,000 birds in them. 2 – Birds must have access to the outdoors. Sounds great, doesn’t it? Sure does until you learn that access to the outdoors means a one square foot door leading to a 12’x12′ concrete patio. 3 – Birds are fed a certified organic vegetarian diet. Great unless you are an omnivore like a chicken. 4 – Hens are never given antibiotics or hormones. That actually is a good thing. 1 – Our birds live outside in small groups and have a movable shelter where they sleep and lay eggs. 2 – As stated above, our birds are outside. They are surrounded by an electrified fence to keep them safe from predators. They are moved to fresh pasture at least once a week. 3 – Our birds are fed noncertified GMO-free feed from a local mill. Being outside, they eat bugs and worms and grass as well as their feed ration. They are given fresh water at least daily. 4 – Our hens are never given antibiotics or hormones. I hope this helps differentiate us from the organic eggs you find in the local supermarket. One purchase can support an entire community of local businesses. When you buy from Liberty Acres Farm, you aren’t just supporting Liberty Acres. You are supporting Johnsonville Farm and Garden, where we get our freshly milled custom non-GMO feed rations, along with other farm supplies. When you buy our pork or lamb you are supporting Lehigh Valley Meats, who does our USDA processing, smoking, sausage making and packaging. 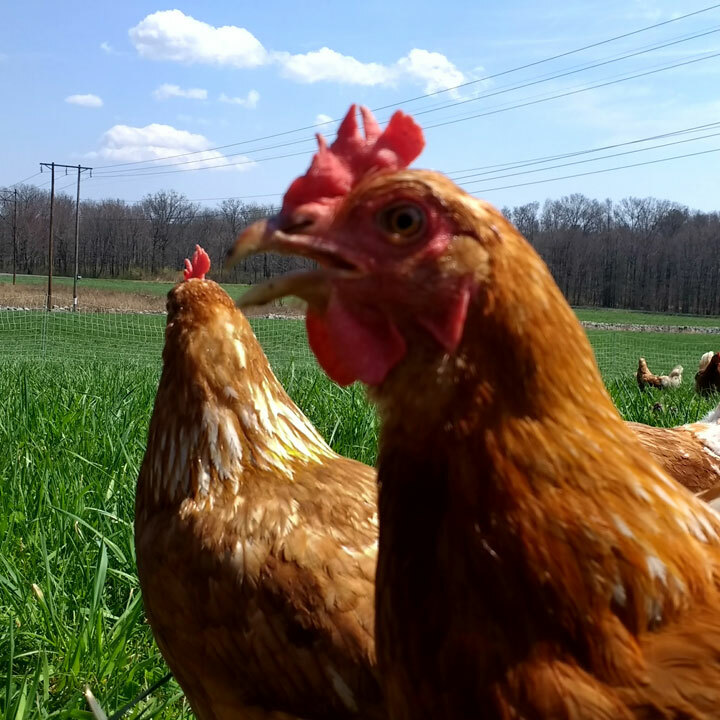 Our hens come from just down the road at Moyers Chicks in Quakertown. Our piglets come from Poliskiewicz farms around the corner from us and our broilers and turkeys from Reich Poultry. Along with these major suppliers of ours, there is also the local hardware store, auto parts store, along with others. We believe shopping local is not only important for our customers but equally, if not more important for us.